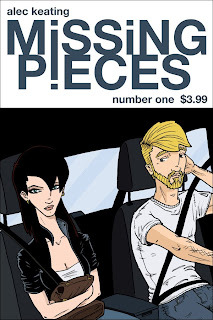 Alec Keating sent me a review copy of his new comic, Missing Pieces #1. The story is pretty straight-forward: Jeremy got dumped by his girlfriend and, while driving out to San Diego to start a new job/life, he picks up a hitchhiker by the name of Sophia. They have a somewhat tense and awkward (but still generally cordial) discussion as they continue westward. That is, until they stop off at a gas station where Sophia seems to go a bit off the rails. It's a story that a lot of creators, I expect, would not attempt. The vast majority of the issue takes place in Jeremy's car and, with the exception of the last two pages, the story is all about these two characters talking. Most of the book, in fact, is a talking heads piece. Keating doesn't even attempt the story cliche of starting with the action from the end and then presenting the rest of it as a "here's how we got to that point" journey. (Effective though that approach is in small doses, it's become rather an overused trick if you asked me.) Again, except for the last two pages, we're really talking My Dinner with Andre storytelling here. So, to Keating's credit, he's set himself up for a challenging first issue. Also to Keating's credit, he doesn't just present two static headshots for page after page after page; he changes angles and perspective repeatedly, so the reader doesn't get bored from the art. Keating also makes pretty good use of spotted blacks throughout the book. I'd personally like to see a little more variability in line weights, but the spotted blacks do a very good job of preventing that from being a real issue. As for the story itself, there's not a lot of story there yet. This issue is mostly set-up, and establishing the characters. Creatively, this probably works well in the context of the overall story, but it does leave this first issue feeling a little light. Especially in lieu of the fact that of the only two characters we really have in the issue, one of them is deliberately guarded and mysterious, leaving readers with only one character to get to know and almost no action. Like I said, this probably works in the larger tale, but it feels a little sparse for an introductory issue. At this point, I can't tell where Keating's going to take the story. There are lots of places he can go from here, all of which will certainly take Jeremy places he hasn't been before. A lot of the options, at this point, could be relatively predictable from a story perspective too, but given the path Keating's chosen to open with, I suspect that predictable is one thing Missing Pieces won't be. The first issue is for sale on the author's website and at most Newbury Comics locations in the New England area. He also notes that the second issue should be available in early December.